Custom stickers are an effective tool for your business and there are many different ways you can incorporate them into everyday things you do to get your brand and products noticed. As fun items your fans will love, or useful ways to label your products and share information about your business, custom stickers can be designed to match the personality of your brand with your artwork and custom shapes. Let’s take a look at some of the ways we see stickers get used everyday for marketing, branding, and promoting businesses. Custom stickers are an easy way to let your customers share your brand, and become brand ambassadors for you. Logo stickers are fun as an added bonus to a purchase, or a free giveaway item stacked on a counter by the register for customers to take along with them when they leave your store. Stickers with fun designs are inviting and can appeal to all ages, making them a perfect way to get your brand in the hands of your fans. When it comes to advertising your business, stickers can increase the reach of your brand well beyond your storefront, as they travel around with your fans on their favorite items such as water bottles, laptops, and more. Sticker marketing campaigns can be highly effective in getting new brands in front of audiences in a creative, and fun way. For a new brand or product it’s important to make sure your brand is remembered, and with custom stickers you can make a first impression that really sticks. Custom stickers are an excellent way to label your products. With custom shapes your stickers can be cut to compliment the shapes and sizes of your packaging. As an alternative to custom labels, which are ideal for indoor use, Kiss Cut Stickers are a durable option to label products that will be headed outdoors, and can be finished on a roll for easy labeling. Keep your brand alive on outdoor gear, and other types of products intended to be used in the natural elements. If you have multiple products in your line, you can also get Sticker Sheets and have multiple packaging designs on the same sheet. This works well when you want your products to be displayed as a unit, get your branding ready to make that important first impression with your new customers. For a new way to include a call to action with your marketing materials, try adding stickers into your mix as a unique addition when you hand out your business cards at a networking event When you add your website and social media handles into your design, your custom stickers can become a new way to remember how to find you online. This also lets your new fans continue the conversation, and keep your brand at the top of their mind. If you have multiple locations, instead of sharing a printed brochure style map, you can compliment your online location listings with a custom sticker that highlights where people can find your different locations. If you have an ecommerce business, or just find you ship a lot of purchases to your customers, you can use custom stickers to brand the outside of your shipping boxes. With branded packaging your customers will know they are getting something from your brand the moment they see the box on the doorstep, and all it takes is adding your logo sticker to the outside of the box. 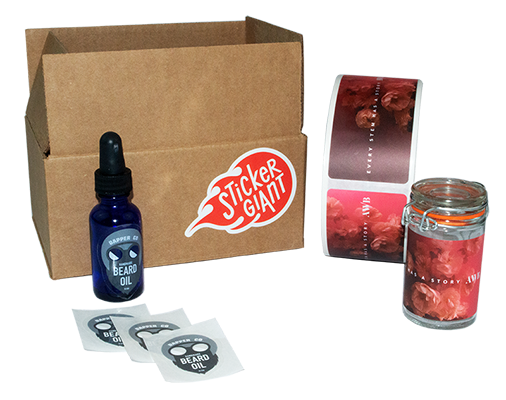 You can also add stickers to orders you ship out, giving your customers a fun bonus to find when they open their box. In addition to promotional materials such as logo stickers, or product labels, stickers can also be a unique addition to your product mix. For artists, custom stickers are a way to share your art, in an economical way that can also appeal to wide audiences. People of all ages love stickers, and it seems they can always find a new place to stick a great design or piece of art. Die Cut Stickers can be laser cut to your custom shapes, and will be finished with no visible backing to really show your artwork to the world. Bands have been building their communities of fans with the help of custom stickers for decades, and you can do the same thing. Bumper stickers, and anything your fans can use to shout to the world why they love your brand, organization, or the cause you are supporting are highly effective at building a brand community. Fun designs that speak to the culture of your company, the quirkiness of your products, or the sophistication of your agency let people show the world they are proud to be a part of the community your are building. For a business, there are few better advocates than your team, and custom stickers are a fun way for employees to share that passion with the world. Stickers can be a part of new employee welcome packs, along with branded t-shirts or water bottles, and are something your longtime employees will love too.